Many files are sent through employee-managed file synchronization and sharing solutions that operate almost totally outside the control of IT oversight. Most corporate content is not encrypted and is therefore subject to interception by unauthorized parties. Senders who send content via email and most FTP systems lose control over this content. This means that a sender or the corporate IT department cannot control who has access to this content, who can print it, or how long the file will be usable. FTP systems and the content stored on them are often not properly managed, thereby increasing the potential for data breaches. Chain-of-custody and audit trails for corporate content cannot be properly controlled or maintained when files are sent via email or FTP, increasing the risk for content that must be used for legal or regulatory purposes. The result is that the status quo of file transfer in most organizations can be considered UFT—or Unmanaged File Transfer. What is needed to overcome the problem, therefore, is Managed File Transfer (MFT)—a solution that will enable complete control over content, its lifecycle, access rights to that information, the maintenance of an audit trail, and disposition of data according to corporate governance requirements. 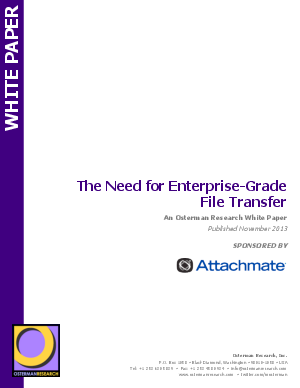 This white paper, sponsored by Attachmate and based on a survey conducted by Osterman Research, describes current file transfer practices and the extent of risk that organizations face by not managing file transfer properly. It also explains the benefits of MFT and provides guidelines for evaluating file transfer vendors.